I made these pulls out of some scrap ash, using 3 bits on the router table to make them, I had a lot of fun making these. Everything has its place, everything in place. 5 Recesses to hold the sharpening stones. I used this joinery method on the frame, I love seeing the end grain come out. I had been spending a lot of time working on restoring hand planes and also working a lot with my hand tools and something that I really never got to terms with was how to sharpen my tools. What I usually do in my shop is always organise my shop into workstations and this was no different after researching and spending a little money on some honing guides and I also took a class in how to sharpen, then realised that I hadnt purchased any devices to sharpen my tools with, I decided to go with Diamond Stones and yes there are cheaper alternatives such as sandpaper or water stones. Si I decided on making a sharpening station which would hold everything that I would need and also having it all in one place. Recently I have been either restoring hand planes or using my hand-tools and sharpening has always been a bone on contention for me because I never seemed to have any of my sharpening stones or honing guides to actually carry out the sharpening. I thought that if I remedied this problem that I had and put everything in one place then I would sharpen my tools a lot more often. So I have spent a lot of research on methods of sharpening, do I go the dry or wet root so I fooled around with both and decided to go with the dry method, so I purchased 2 DMT diamond sharpening stones and since I already had the Veritas MKII honing jig I used that until I was comfortable and then master hand sharpening with out the aid of guides. I also took a sharpening class at my local Woodcraft store which I found very informative especially on the technique end of the process. I did a lot of research online and I decided to incorporate 2 features to the sharpening station, the first was to create recesses in the sharpening tray which is where the diamond and honing plates will sit and the second was to incorporate finger (box ) joints, just to add some decorative elements to the station as I will be using some poplar and oak. I usually always create a 3D rendering of the project and this was no different, below you can see what I came up with. 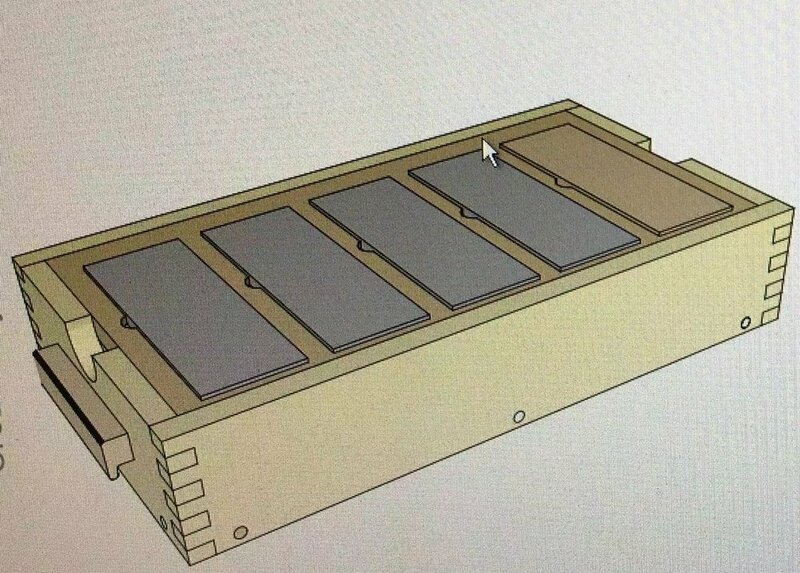 Here is my Sketchup model that I used to build my station, its my design. - The station is made from poplar and oak, the joinery method is glue and box joints. 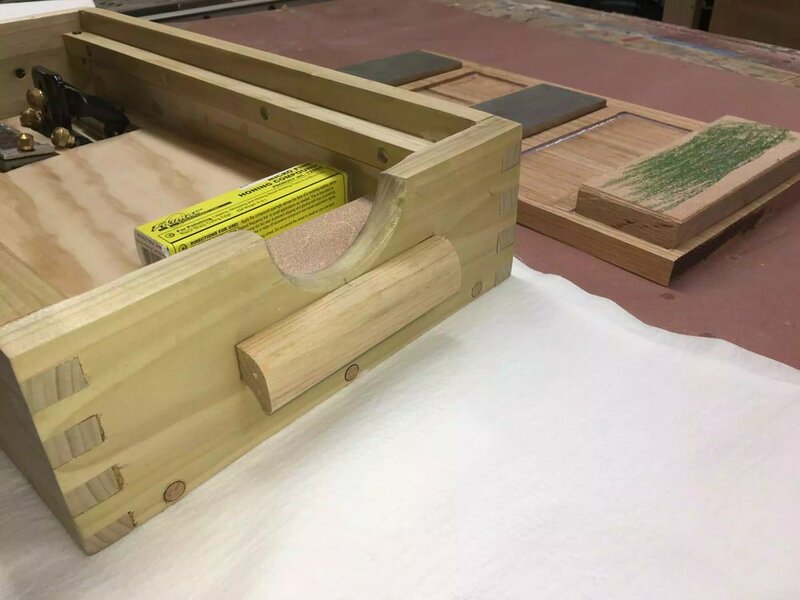 - The upper tray where the sharpening stones are recessed into is totally removable revealing a box where I can store all my honing jigs, strops and the like. -I created recesses in the base to hold all the honing jigs so as that they would not rattle around in the box. - I also made my own handles out of scrap ash that I had from a previous project. -Finally applied a urethane finish to protect it from the abuse I know I will be giving it. I have to say that having the station is awesome and it is right beside my bench whenever I need to sharpen my tools, if I ever get to build a traditional woodworking bench I will add a cleat to the underside of the station that way I can clamp it into a vise on the bench.